Vibracoring Overview - PVL Technologies, Inc.
push-coring) to push the core tube into the sediments. 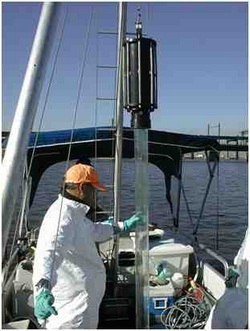 The decision to utilize vibracoring as the sampling method should be based on the knowledge that the sediment and sampling conditions are conducive to the technique. In the absence of information regarding the sediment properties, a more robust technique employing impact or inertial samplers may be the best option, particularly when mobilization costs are high, or time does not permit a backup plan. Very often, soils which are good candidates for vibracoring tend to be difficult to retain in the core tube during extraction and retrieval. For sampling sediments of this type, the core tube can be fitted with a core catcher, which ideally acts as a one-way valve which opens to let material enter the bottom of the tube and closes to prevent loss of material during retrieval. The main drawbacks of using corecatchers are that they represent an additional expense, require time and effort to install and remove from the coretube, and they tend to disturb the sample by causing intermixing of the material in the core, particularly at the outer boundaries, which can make observation and analysis of the sample stratigraphy difficult or impossible. This is particularly true when metal corecatchers are used for collecting soft sediments. In addition, the depth of penetration and length of core sample may differ. The difference can be attributable to densification of the sediments as they are collected in the core tube. Measurements of both should be kept for better understanding of the variability of the sediment material in the area of collection. Sediment loss may also occur as the lower end of the core tube breaks the water upon lifting. Capping the core just below the waterline is good practice. Generally, rounded particles are more efficiently re-oriented during vibracoring and lead to recovery of longer samples. Inclusions will tend to block the penetration of the vibracore. Cementation, arises from chemical /physical modification of the soil, either by natural processes or due to the presence of contaminants. Also includes vegetation and/or structural changes due to activities of animals (e.g. coral). While the list of potential complicating factors seems large, in fact most of the situations in which sediment sampling is required are those in which the sediments are recent, loose, and fine-grained. This is generally true because the goal of sediment sampling is usually to look for man-made contamination generated within the industrial era, generally within the past 75 years. Typically, fine-grained material which has been naturally deposited through water is the ideal candidate for vibracoring. Deposition through water yields sediment of very low density, so that the potential for vibrational densification and hence penetration using the vibracore is excellent. When assembled with the core tube, the vibracore is top-heavy and must be guided to keep it in an upright position. When sampling in shallow waters and when surface conditions permit, it can be manually guided by keeping a small amount of tension on the support cable and jogging the winch to gradually lower it into the sediment. This approach is most successful when direct visual observation of the vibracore is possible. However, in some cases it will be more effective to use the VC-STAB stabilizer accessory to guide the vibracore. The stabilizer consists of a weighted base, and submersible buoys attached to the base with wire rope. The wire ropes are thus kept in tension and the keep the vibracore upright, while permitting it to slide along the wire ropes as it penetrates into the sediment. 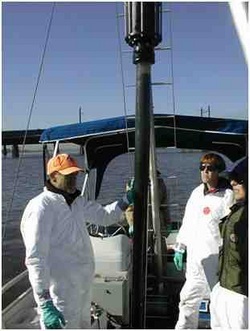 Use of the stabilizer is only recommended when sampling in low energy areas (low velocity water currents). Currents and tides may cause the vibracore to drift. A boat (pontoon boats make workable sampling platforms as do single hull vessels with a frame mounted on the stern). Vibracoring with the VC 3.5.2 is most efficiently performed with at minimum, a two-person crew. Keep in mind that, aside from the fixed gear and the crew, the deck of the boat must be large enough to accommodate the empty core tubes, the retrieved sample tubes, the electric cable for powering the vibracore, anchors, personal gear, etc. position until the bottom end is capped, the water above the surface of the core is removed, the excess tube above the core is cut off, and the top of the tube is capped. This process is facilitated by using a tripod or other type of frame tall enough to permit the core tube to be lifted completely out of the water while still attached to the VC-3.5.2. A hoist having a lifting capacity of at least ½ ton (1,000 lb.). 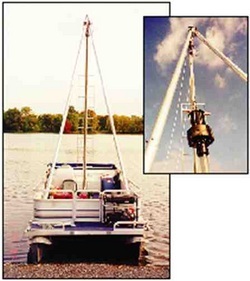 Use a motor-driven hoist, unless a limited sampling program at very shallow depths is planned, in which case a manual hoist will suffice. An electrical generator powerful enough to supply the vibracore and the hoist. Note that the startup current for both the vibracore and winch will be much larger than the running current, so choose a generator accordingly. A pump and hose for washing down the deck after sampling. Protective clothing and safety equipment to prevent exposure to hazardous material when handling core-tubes and sediments. Option 3 and 4, metal core tube w/rigid plastic and poly bag liner shown with core catcher assembly. A brief summary of a typical operating procedure is provided to assist those who have limited experience in vibracoring. Core tube/liner Option 1: Expendable clear polycarbonate coretube (no liner). Insert core tube into flange and tighten down. Core tube/liner Option 2: Expendable clear polycarbonate coretube with plastic corecatcher (no liner). Attach core catchers into end of core tube with pop rivets or glue in a day or more prior. Insert core tube into flange and tighten down. When using configuration 1 or 2, each (expendable) core tube is cut, capped, taped and normally stored vertically until opened for analysis. Core tube/liner Option 3: Reusable metal coretube with expendable flexible polybag liner and reusable corenose/core catcher . Starting with the aluminum core tube removed from the flange and with no core catcher installed, the 6 mil liner is inserted in the bottom end of the core tube, pulled through and out the top. The liner is brought out the top and folded over the core tube with about 2-4" of material. Now, one of two configurations can be used at the lower end of the core tube, depending on the nature of the sediment you encounter. If the material is cohesive, a plain core nose (without fingers) can be riveted in place to protect the liner and fix it in place. For clean, poorly graded sediments or sediments that otherwise require the core catcher, the core catcher will be riveted in place. At the bottom end the liner is cut, folded back over the outside of the irrigation pipe, and the core catcher is then inserted and pop-riveted, which secures both the liner and the core catcher. The rivets we recommend are aluminum alloy, which are strong enough to do the job, but easy to drill out and remove. Core tube and liner are then clamped in the flange on the vibracore power head. After coring the rivets are drilled out, and the irrigation pipe and core catcher can be re-used. Using a battery powered drill, the rivets are drilled out and the core nose/catcher removed. The two large holes in the bottom of the core catcher are provided so you can insert a screwdriver to pull on the core catcher when removing it, in case it is stuck. The core tube is inserted into the flange on the power vibracore head. Once the vibracore has hit refusal and been pulled back up, the liner will contain the sediments with a layer of water on top. If using the poly bag, the tubing can be lain horizontally after removing from the flange. For all other options, the vibrocore is left vertically to remove the nose cone and cap the bottom of the liner. Remove the overlying water by drilling holes above the sed/water interface. Then the tubing is cut just below these hole to cap the core intact. The core tube is removed each time it is brought up. You need to remove it vertically when using all options but the bag liner. The poly liner option can be removed upright but needs to be laid horizontally to remove the liner from the core tube. In all cases, this requires the removal of the core catcher (if used).